China has claimed there are “strong political manipulations” behind the case. Huawei chief financial officer Meng Wanzhou arrives at a parole office in Vancouver last month. THE US JUSTICE Department has unveiled sweeping charges against Chinese telecommunications giant Huawei in two cases likely to ratchet up tensions between the two superpowers — including that of a top executive arrested in Canada on a US warrant. 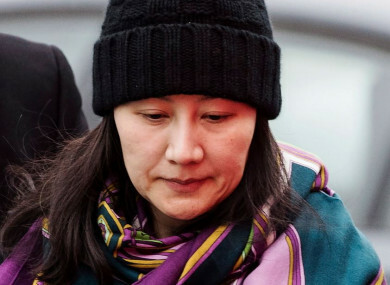 The department yesterday unveiled 13 charges against Huawei Technologies, its chief financial officer Meng Wanzhou — the daughter of the company’s founder who is currently out on bail in Canada — and two affiliates related to violating US sanctions on Iran. “Both sets of charges expose Huawei’s brazen and persistent actions to exploit American companies and financial institutions, and to threaten the free and fair global marketplace,” FBI Director Christopher Wray said. In a statement sent to AFP, Huawei denied “that it or its subsidiary or affiliate have committed any of the asserted violations of US law set forth in each of the indictments”. Meng — who was arrested in Vancouver on 1 December at Washington’s request — is expected to fight extradition to the US, amid heavy pressure on Canada from Beijing, whose subsequent detention of two Canadians is seen as an act of retaliation for Meng’s arrest. Late yesterday, Canada’s Justice Department confirmed that officials had received a formal extradition request from the US, Canadian broadcaster CBC reported, with a hearing set for 6 February. “There are strong political motivations and political manipulations behind the actions,” ministry spokesman Geng Shuang said in a statement, urging Washington to stop “the unreasonable suppression of Chinese companies including Huawei”. They allege that between 2007 and 2017, Meng, Huawei and the subsidiaries sought to mask their business with Iran in violation of US and United Nations sanctions on the country. Huawei and the affiliates also lied to US authorities, obstructing the investigation, they said. Beijing has renewed its demand for the US to drop its warrant against Meng and for Canada to release her. Engineers of Huawei — which was supplying T-Mobile with phones — took pictures and made measurements of parts of the robot, “even stealing a piece of it”, Whitaker said. The Justice Department charged that the Chinese company had, in July 2013, offered bonuses to employees “based on the value of information they stole from other companies around the world, and provided to Huawei via an encrypted email address”. The indictments came as Chinese Vice Premier Liu He arrived in Washington yesterday to lead trade talks this week, according to Chinese state media. Speaking together with Justice Department officials announcing the indictments, US Secretary of Commerce Wilbur Ross said they were “wholly separate from our trade negotiations with China”. Email “US charges Huawei in technology theft and sanctions violations, angering China ”. Feedback on “US charges Huawei in technology theft and sanctions violations, angering China ”.